The arrival terminal at Myanmar’s Yangon airport ushers you with resplendent granite, gleaming, spotless floors and high ceilings, efficient people and the FEC. Automatically you get initiated along with the conversion of your dollars to a unique if subversive politico-economic junta. The taxi man on negotiation of the broad roads and clean culverts Kyats (pronounced chats) you up and shows you a tatty album of endorsements by happy tourists. All quotes for wonderful destinations are in USD. The wife digs her elbow in, flashing kajal eyes with admonishments and gestures of ‘I don’t like hard sell’. We check out the Y and other alphabets in the Lonely Planet and try and make off season deals in May all the while speaking two Myanmar words, AC. All rates at hotels are plus or minus Air Conditioning. The government alternates power so every other day there is electricity, which simply translates to every other day there is no AC. The alternate power and democratically elected is under house arrest. There is angst over Aung San Su Chi. To visit the Shwedagon Paya with its 8,000 plates of solid gold and diamond encrusted stupa, all foreigners have to pay in USD. It is a conspicuous symbol in Yangon of the disparity where opulence is a terrible understatement. The friendly gentleman in lounji who moonlights as a guide indicates that his pension is $3/month while the hotel bill for a day could sustain him for a year. The moon light bounces with the sodium vapour making Swedagon an ethereal sight. The leaflet meant for the tourist is propaganda indicating how the military trustees are doing all they can to make the Paya more wealthy. One look at the people milling around the Pagoda propitiating their birth sign icons would indicate a deviated value. Everyone wants to talk about the political scenario but there is so much looking over the shoulder that chiropractors must have a huge clientele. 2500 years ago the Buddha discovered that desire is the cause of all suffering. The philosophy of Anicha (impermanence), is taught in the Vipassna meditation centres. Myanmar seems to in a very small space encapsulate influences. There is a large community of Tamil Indians who know no Indian language, they came from colonised India. The British left Anglican and Methodist churches whose gothic spires make dents in the Yangon skyline. The cavernous interiors rattle with a geriatric community. Post independence certain communities have not found the same favour, job opportunities are chiefly all governmental, private enterprise is difficult to sustain. The expensive Pajeros are driven by the Chinese or those connected to the establishment. The new aristocracy live in plush houses by the lake and no doubt wear olive green with epaulets to work. The universities known for dissenting voices have been shut down for the last five years. Engineers have become farmers and chemists tour guides. There is an undercurrent of frustration. The monks form a single file in their burgundy robes and ‘mindfully’ enter the dining hall or go begging in the morning for the only meal of the day.The Ayeyarwady river is omnipresent in Myanmar. Much logging activity happens along it, within it, the rusted ferrys that ply across the delta have their own sub culture. The upper deck has painted rectangles marked on the boards where you can take residence for the journey. People instantly spread plastic sheets and curl up ready for a protracted trip. Rarely, never do you see people complain. There is a kind of resignation that is wonderful and horrible simultaneously. The Road to Mandalay is where the video coaches ply. A saccharine voice welcomes you aboard Leo Express and promises to take care of ‘your physical, emotional and spiritual needs’. If for just an instant you thought you were on an omnibus to heaven, the soppy films with predictable endings shown throughout the night at high decibel and compact lady in the seat across nibbling dried jerkin, weeping tears of bathbrick would jerk you back to reality. Vehicles are right hand drive and are driven on the right hand side of the road. Overtaking is always a nightmare. Skinny, schizoid dogs make lupine gestures at the cars. Gasoline is black marketed. All along the road there are ad hoc stations with petrol in unsafe containers decanting fuel. The government pumps rationed quotas. The other side of the river studded with payas, has a couple of fabulous wooden monasteries on stilts. In the adjoining monastery 7 year olds novices are mugging for an exam, the temporal and the spiritual run like an old juke box, drop in a coin and listen to what you will. Most women and some men wear a paste of tree bark called Tatanka on their faces as a sunblock and cosmetic. In the poorer houses there are no closets with belongings just an altar to Buddha and a place near a window with a grinding stone and ingredients for Tatanka. The people are indiscriminately gentle, hospitable and alarmingly open with genuine kindness and beguiling smiles who will literally walk the extra mile to be of help. It is obvious how they can be taken advantage of. The Kuaungh Mudaw Paya whose unique white pagoda is said to resemble the perfect proportions of a queen’s breast, is ironically in a place called Sagaing. Bagan must be one of the most impressive places in all of Myanmar and not surprisingly the reason for its bankruptcy. It was a place in the 13th century that stood for conspicuous consumption. Real estate developers created 13,000 payas. Our young friend and guide, Caesar said he spent a sleepless night thinking of all the places he needed to get us to and where the best angles would be for photography. From atop of one of Bagan’s highest payas he indicated a corner that he says he will never forget, where he and his Canadian girlfriend watched the sunset. Kublai Khan sacked the city in 1287 and In 1973 a great earthquake destroyed much of the megapolis. Realising the tourist (read USD) potential of the place the government has begun ‘restoration’ work that would indicate a damaged mind. They recreate new payas leaving man-made cracks to resemble the old damaged structures. Even so, the place has magic and an alchemy of energy that can take you any place you want. In the Anando Pahto there are 4 standing gold buddhas facing the four directions, three of them have their hands by their sides the fourth one can’t control himself, he has his hands outstretched beckoning, uplifting, a shaft of light neonifies his fingers, a sparrow decides to take the invitation. Everywhere even in small towns you see signs that indicate ‘country club and golf course’. One wonders if these were accessible to the public at large, Myanmar would have challenges to Tiger Woods. The people who live outside the inner coterie, like people in that category anywhere in the third world have learnt to toggle a switch in their heads and hearts and find happiness in simple things. The Buddha must smile, but surely near the ostentation of the gold Payas and the rich trust funds must exist only man’s vanity. 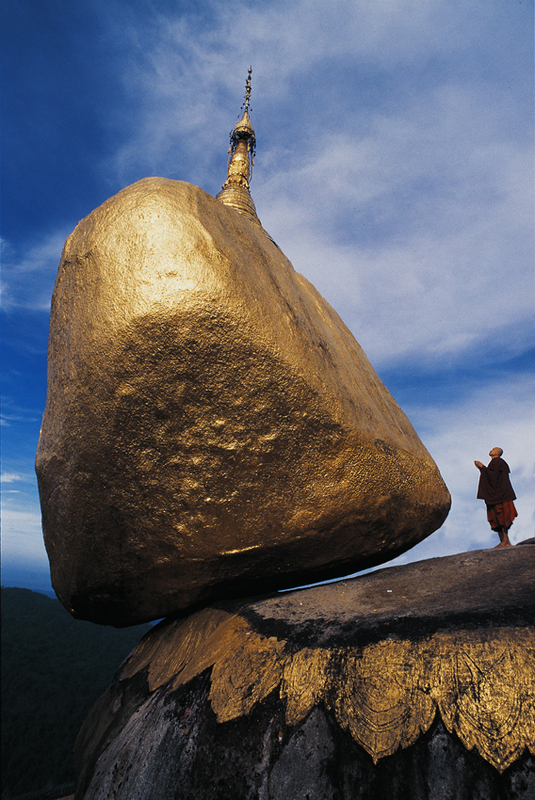 The Kyaiktiyo or Golden Rock monastery has this wonderful rock teetering on a cliff hanger by the hair of the Buddha. The steep hill is partially accessible by Canter trucks driven by manic drivers. People are herded in like cattle on the floor boards in the back . It is a very rough ride to the point of exit, then like punishment foreigners are made to walk the remaining steep incline after paying the absurd USD 6 a piece. It is a surprisingly inhospitable gesture that cannot originate from the anything but hospitable people. The authorities seem at all junctures to inform you that we don’t like you just your USD. Sedan chair carriers poke fun at those huffing and puffing to make the steep grade all the time announcing 3000 Kyats as one makes the steep spiral upwards, the rates keep spiralling downwards till they reach break even point and then without a murmur they disappear. But the top like most mountain summits is awesome, the view is stunning and this, one of the most sacred sites in Myanmar is fantastic. Pilgrims plaster gold leaf on the rock which is swirling in a morning mist, the sky opens for an instant revealing a nugget so large that it dwarfs the monks around it. The golden rock paya seemed like a good place to end this cameo visit to Myanmar. The departure terminal seemed like such a departure from the Arrival. Even the staff could not hold the facade any longer. Myanmar seemed to be saying we tried to impress you as you came in but realised that its too much of an act to sustain. The fact is that Myanmar is impressive, the people are some of the warmest and kindest people I have met. I do know that the Anicha message of the Buddha is organic with them. Impermanence is the watchword. Generals watch out. Morocco has always been rather high on my list of countries to visit. Albert Watson’s remarkable book Cyclops embellished with its stochastic screen trio tone reproductions has wonderful photographs of the exotic and the fetishes of Morocco. Quite by chance recently, after sending a proposal for a book to an overseas organisation, they wrote back saying ‘Go to Marrakech’. Initially I thought that that phrase in German might mean go to hell or something equally discouraging but discovered that they were in fact talking travel. Very quickly I had to find out all I needed to know about Morocco. An Italian friend gave me an invaluable piece of advice, ‘ take hindi film audio, video cassettes, and film posters’ was his terse message. I did take some 35 current hindi film tracks, Dil to pagal hai and Hritek Roshan and that kind of thing. Morocco is not connected to Mumbai easily for reasons that were going to become abundantly clear later on. You can get to Marrakech via Amman by Jordan Air with a stop over in Amman, great if you want to visit the Nabataen tombs and Treasury of Petra, Jordan is a beautiful country in any case, all air routes are via Casablanca of Bogart fame, but you will be disappointed with Casablanca, its name is far more romantic than the reality. From Casablanca you can fly to Marrakech via Air Moroc. I choose to go via Milan, Barcelona (Alitalia) and Barcelona -Casablanca- Marrakech by Air Moroc, only because I needed to firstly catch up with friends I met 22 years ago and I needed to photograph the Sagrada familia and other Gaudi architecture. I also needed to research Flamenco. Morocco is on the north western coast of Africa on the Mediterranean. It is 8 km away from Europe, has been colonised by the French and only recently after India’s Independence got its own. But it has been at the cross roads of all kinds of trade and cultural exchanges between Europe and Africa and Asia for centuries before that. It has predominantly Berber (fair skin blue eyes) and Arab (brown skin, curly hair) influence. The languages spoken are Arabic and French. The Arabic is a dialect and different radically I’m told from that which is spoken in Arabia, but in Arabia they speak all kinds of dialects too. Since I attempt to speak a smattering of Arabic and French, no verbs please, we’re Indian, just nouns strung together with the infinitives, I sort of managed. The government has reaslised that French is not a doorway to the world (I wish the French would realise that too) and now teaches English as a second language in schools. In ten years time you will get by quite nicely in English. But I feel that language is a barrier and not a barrier if you are disposed to listening with your eyes, nose, skin and heart. My feeling is that the attempt one makes to understand people itself is the catalyst that opens wonderful insights. Translators have their place, sometimes very away from the actual photography. True you will not be able to discuss Hegel and Kant and Vivekanand, but there are many things where sheer observation is communication. Photography being the handmaiden of observation, photographers ideally should have little problem. Morocco has a conservative islamic generation that is layered in the predominantly youthful, liberal population. It is not uncommon to see three generations of women, the grandmother in orange jelaba with veil up to the nose, the mother in printed jelaba, no veil and the daughter 20 something in tight trousers and figure hugging top, platform shoes, trendy shades and coiffured, full kissable lips, chewing gum and walking nonchalantly down the jamaal el Fna. The women are gorgeous and the men too, light eyes, olive complexion, crisp hair. The covered souks are situated in the Medina, a generic term for an ancient (10th century) labyrinthine, Islamic habitation. The passages have typically high walls, close together (desert culture) no windows, just tiny doors where you have to stoop to enter. The doors are grungy and non discript but they can open into mind bending Riyads (private homes) that are ancient and fabulous with mosaic work and fine plaster reliefs. The Riyads all have a central courtyard and all the rooms open into this common meeting area, like our havellis in Rjasthan. Several Foreigners, including Albert Watson now have winter Riyads in the medina. Hermes the french silk scarf couturier has a home that has a mosaic swimming pool on the first floor and over the top artifacts on every square inch of wall, quite bewildering to behold. He has even managed to put in an elevator . All the homes in the medina have no more than one floor. The food is great though being a born again vegetarian I could enjoy the smells of escargot soup and brain and organ transplant dishes. The salads and olives are just too delicious. Oranges fall from burdened trees on the ground to rot. It would be safe to assume that orange juice is cheaper than bottled water. Everywhere in the medina I’d be accosted, hello Indian would be the common refrain. Indians and myself in particular can be mistaken for many other nationalities, Greek, Arab, Latin, Pakistani, Sri Lankan, Banglasdeshi. It would surprise me. when I mentioned this to a French colleague he remarked ‘frankly David you don’t look Norwegian’. So I guess I must look ‘Indian’. Then they would proceed with the roll call, Amitabh Bachaan, Sharouk Khan etc etc, reminding me of the days on the Bosphorus in Istanbul when during conversation it came up that I was from India, all other leads came to a grinding halt and all my host wanted to know about was Raj Kapoor and Nutan. One day at lunch the waiter made the now familiar discovery of my being Indian, and started with the litany of Bollywood stars to which I just nodded with my mouth making herbivorous gestures of stripping the olive flesh from the stones.Then on my way down he began singing ‘Aa Jaa Aa Jaa’. I had to turn around and give him a hug and promised the next day to give him a hindi audio cassette to update his repertoire. In the souk I would ask people to do strange things for my photographs and they would oblige. Because of the heavy tourist exposure, the invariable tip in Dhirams would be solicited. I would say no Dhiram but would give away a hindi audio. Then the assistant at the shop came up to me and asked for a Sharouk Khan tape and I told him that when he would open his shop the following day at 9 am I would come by with the tape, to which he nodded with a disbelieving look that says I’ve heard this don’t call me I’ll call you. The following day I turned up as he was raising the shutter and handed out a cassette with SK on it. He took it but was not entirely pleased, he said no I want Sharouk Khan, Sharouk Khan, then I had to point out that the face on the cover was indeed Sharouk Khan, when he realised this he went running down the street with hands flaying wildly and screaming like a banshee in excitement. For the first time in my life I felt some respect for Bollywood and its ambassadorial role. The Gnawa music of Morocco most closely resembles Soul. It has that blues quality that is distinctive. The musicians dance with a tassle on their caps kept twriling as they make rhythmic movements with their necks, its a dervish derivative and can be mesmeric. Not many Indians pass through Morocco and this is why no flights go there directly. people are curious about Indians, kind of third world bonding. They would excuse me most generously for not being muslim. Everywhere I went people wanted to sit me down and over zillion cups of mint tea would want to know about my life and my country while invariably the light would get to that magic phase where everything is sublimated. Yes they were interested in selling me the odd kitsch, but were genuinely absorbed in discovering India. A very genteel people who despite their exposure to tourism and commercialism are not hard sell. There is more to Morocco than the Marrakech medina for sure and I will be back to photograph this ancient culture assimilating change yet holding on so organically to that which makes it unique. motion of omnibuses radially over Siam. that advertises in neon, thirst and lust quenchers. The lights are dim, the music disco and synthetic. Mirrors form walls. You see double. Young gentle bodies gyrate. The music pulses. hopes and aspirations. The real world at fourteen. Inebriated gringos enter followed by a harlot. A ripple of artificial giggles. One more swig and a stagger. The mirrors reveal the truth, a reflection of oneself. A Lovely creature sidles up. She is warm. She is sweet. Hesitancy multiplies her charm. Introductions are made. A rose vendor telepathetically senses the instant romance. Shows a bloom. Sells a couple. A photographer appears from nowhere. Polaroids are squeegeed through whining rollers. The temperature is not 68°C. The instants turn magenta. Lager initiates a tentative engagement. Terms are simple, professional, efficient. A wooden effigy goes through the ritual. Around the doorpost, from under astride legs the tiny Buddha is hurled. Looks are exchanged. A brief display of fatalistic fear. Just as quick normalcy is restored. The gentle woman leads the man by the hand. Outside is a feeling of embarrassment. Everyone is watching even though they look the other way. The music fades into oblivion. Tradition and the Buddha smile, wryly. Dinner is served, the girl is nonchalant. The Hong Kong made Samurai on TV is her Quixote. Somewhere in the personage is a mind seeking freedom. Unhappily preoccupied with the present. The proceedings are tedious and unnatural. Eventually lights are turned out. What has life not shown her yet! a mama and a family in an impoverished village in Loei. Love is made. Repression is removed. Little Zen aphorisms singe the ear. The whore goes back to the magnet. It’s strength has become its weakness. It lies in utter helplessness buffeted by a raging storm. to it’s very miserable soul. The turmoil walks into the crowded, pungent streets. The waterways are contaminated. The air is polluted. The Grand Hall of Budhhas seem speechless. The Standing Buddha opens his mouth to say something. Only a tired yawn emanates. The tall figure crumples, reclines, attempts to sleep. The spore rolls over to the giant ear lobe to whisper into it. Of the Reclining Buddha. It swamps the spore. The salt rubs into its wound and causes great agony. Gradually the moisture induces germination. I write this form a place 100 kilometers from Nasik city and two kilometers from the Gujarat border. Surganna is in the famous Dang teak and bamboo forests. I am sitting in a ‘hotle’ called Guru Krupa. In description this is three star splash for it has six cups and saucers, most others have three or four. 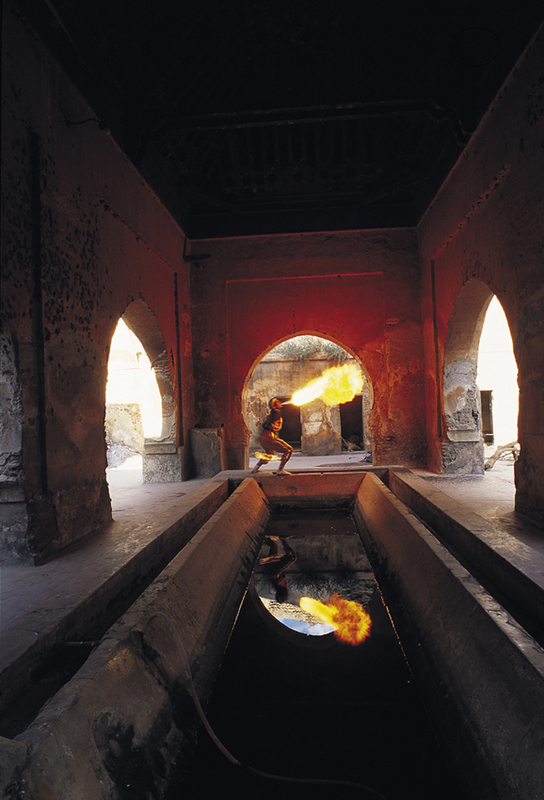 In the corner there is a pathela with a constantly smoldering ……… (chaha). I write it in Devnagri because in English one finds it hard to spell this beautiful word. I don’t like (chai), it sounds too much like chaila , a condensation of tuja aaiee la . Mind you I like the abuse as abuse. To abuse ……. (chaha) is a heinous crime. The ‘hotle’ hangs a kind of cactus to keep away the mosquitos. when I pointed out to the proprietor that there were some mosquitos even sitting on the plant, the man looked pained just raised his eyebrow a bit and said ‘stupid mosquitos’. So I gather that the cactus is only meant for the intelligent ones. The menu though devoid of lobster, salmon, asparagus and anchovies has that famous hors d’oeuvre, shev gatya and salted chilies. Of course you have the cup that cheers as ‘chalu’ (plain) 20p., ‘peshal (special) 40p and ‘takkar’ chaha 70p. Takkar as the name might suggest is a bang between a chalu and a peshal. I tried to tell the owner that from simple arithmetic that would be 20 + 40 = 60p. ‘No , no’, and the same pained raised eyebrow look, takkar is 70 p. I told him that he was cheating the public and that if I wanted a takkar I would order a chalu and a peshal and bang them myself. He made an exasperated head scratching gesture, ‘but sahib, you must know how’. In that case he wins, but then again he loses because I’m a chalu man anyway. I have the notion while reading this through that I’m sounding just a trifle like Busy Bee. But there is only one Busy Bee like the one that coulumnises at the backside of the Evening News. Like I guess I’ll have to call myself lazy Larva or something with that sort of alliteration. There is a small chap here running this three star splash in this one horse town. Every time he passes the shev ghatia he involuntarily pops some into his mouth. You can’t really blame him. Like man this is a hors d’oeuvre. Like the dust in Surganna is bad this place is good with its Liptons Ruby dust chalus and tea stained tables and its flies and pictures of Ganesh, Shiva, and Laxmi. All that’s missing is Anuradha (an ex girl-friend). But she’s safe on Shoellar paper in my closet in Bombay, like skeletons in the cupboard which I am happy to take out and love again. In the Algerian marketplace the little people are rummaging the left-overs. The punk has her hair and elders shocked by the green and fluorescent dyes. The pansy in the café says he’s a coiffeur. The name itself induces a hair cut. The sparrow is among the pigeons and gets the better of the battled over French fry – the arch de triomph. It’s 9:59 and the muezzin is calling in very familiar strains that the sun has set. The mirror mirror on the wall shivers with the rumble of the trains in the Metro trying almost to predict the way of all flesh. While in the Metro the trains earthworm their way subterraneously across each other, over and under the Seine in an amazing labyrinth. The ghastly/lovely center for modern art stands controversially among staid copyrighted Parisian homes a sculpture in tubes. Futuristic glass domed escalators move immobile people along its caterpillar tracts to observe a George Segal plaster-of-paris woman selling tickets. Some stiff upper lipper reads first the plastic tag and then goes into paroxysms of delight – ‘Its a Chagall not quite his usual’. Then gentlemen and lady in hot pursuit chance upon another canvass and in the same unmistakable knowingness remark upon seeing and utterly chauvinistic albeit real depiction of a tribal woman carrying a tribal man, ‘How ingenious, a lady carrying a gentleman’. People are scurrying towards the Louvre. It’s Sunday, it’s free. All beat a path to the Mona Lisa, the Venus de Milo and return panting to the cafeteria to satiate the greatly developed hunger. The magic does not get me. Outside the Notre Dame is playing a harpist in the shade of the park’s trees. A small cardboard box collects my franc. The TGV regurgitates a backpacking crowd all brandishing – Europe on $25 a day – and a Givenchy catalogue. On the trôiseme étage of the Eiffel tower a woman’s false eyelash flutters to earth. The woman has lost her wink. The blacks selling the wind-up pigeons are the most honest-to goodness artists around. Half way across the zebra-crossing the couple in embrace decide its time for the five minute kiss. Lips purse, eyes close and the lights change. The Hondas and the Porches and the Pandas and the Peugots race on leaving a new tomb to the unknown kissers. The machines collect the money. The Mona Lisa postcard is a Leonardo. The one encased in bullet proof glass – NO FLASH PLEASE isn’t. Art is for the people. A red handkerchief attempts to sponge a tear. The Aeroflot bureau is under perpetual guard just in case all the people voicing – art is for the people – want to defect. The Electric Boogie does have a defect. It’s making a scene in the Metro. This train however does not get you far. Michael Jackson is alongside Marilyn Monroe while the rain forms tears on the Pinochet poster. A photographer is expostulating on line, texture, form and his concern for faces along a horizon. The beer falls over and embarrasses his pants. In Pigalle the whore has her breasts pinched together by a clothes peg. While in the bar the pimp has another peg on the best whore house in town. The street artist’s guild is having an intermission while the emission from the Saab turbo engulfs the gilded statues. The Italian magician’s assistant has a face painted on his knee. A Flex draws a smile across his patella while a genuflection can evoke a tear. The woman’s face is falling like the summer end of a glacier. Paris is a marvelous stage where everyone has a role. The performance is a celebration.